So, call us crazy. If you've made it this far in the travelogue, you'll realize that we are pretty crazy in general, but this 'week' would rank right up there towards the top. After spending three days in the Maryland/DC area for a hockey tournament (see the Bowie entry just prior to this one), we had to head back home for one day so that Jill could speak in Cooperstown, and I could go to work for 24. Bright and early on Wednesday morning, we packed the car up again and headed back to the Nation's Capital. 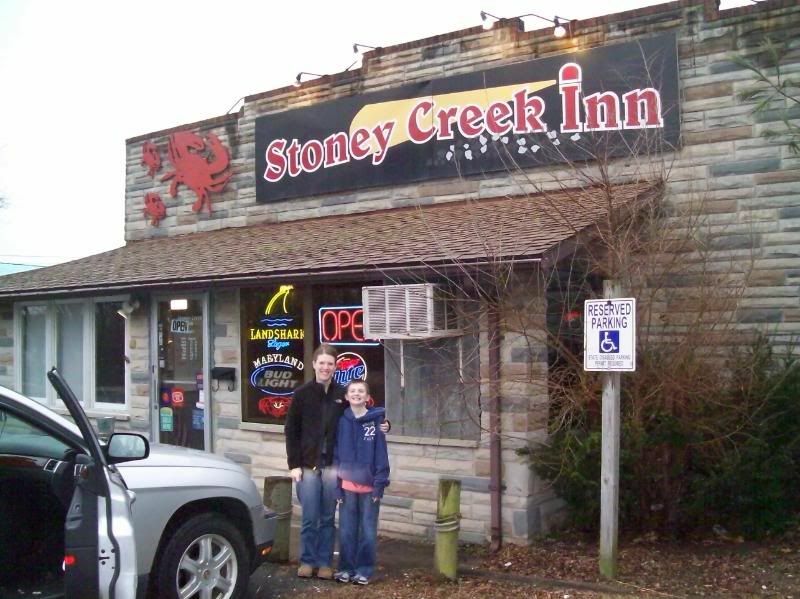 Along the way, we stopped at the Stoney Creek Inn, in Baltimore. Michael had seen this restaurant featured on one of the 'Diners, Drive Ins, and Dives' shows with Guy Fieri and he wanted to check it out. What a find!! A small, out of the way place - blink and you'll miss it - but it was well worth seeking out! Michael had two clusters of crab legs, and Jill and I both had the lump crab meat sandwiches (with a couple of Bud Lights to wash it down). A truly classic Maryland meal, and at least in my case the best crab 'cake' sandwich I've ever had. One to keep on the radar when we find ourselves in the Baltimore area again! Our base of operation for this trip would be 'The Madison', one of the hotels in the Loews chain, located at 15th and M in the heart of Washington, DC. Jill and I stayed at a Loews Hotel in Montreal (the Hotel Vogue), and liked it there very much. The price was right for this hotel as well as Jill found a good deal online making it the least expensive hotel of all of our options for this trip. We left the car with the valet, dropped the bags in our room, and headed out into DC. The hotel was only a few blocks from the White House, so we decided to go there first - no better 'first thing' for Mike to see in Washington than the White House ya know? We approached the White House from the 'front' (the side opposite the Elipse), and even at that point Jill made mention that there seemed to be increased security around the house since our last trip there. As we made our way to the Elipse side of the White House, Park Police were stopping people from walking across the immediate top of the Elipse nearest the White House. We thought this was kind of odd, but when we realized there was a crash/fire rescue truck parked on the premises, we could only surmise one thing! As we made our way along the bottom of the Elipse, we heard the rumble of a helicopter in the distance. Then not one, not two, but three identical 'Marine One' choppers flew right over our heads! Two peeled off and continued on, the third landed on the south lawn of the White House! Yep, you guessed it, President Obama was on his way home and we were there to see it! 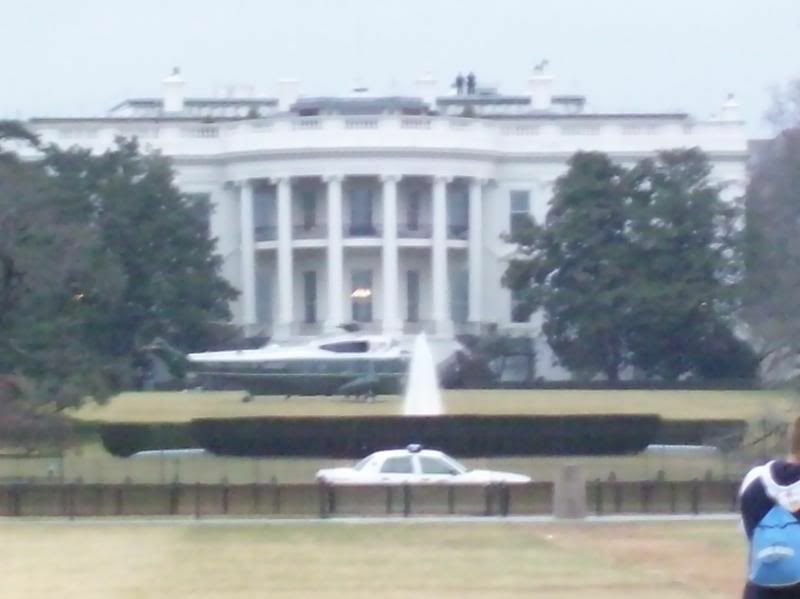 We got as close as we could, and were able to see sets of feet under the chopper in the distance, and we may have caught a glimpse of him scurrying into the White House! All in all, it was pretty durn cool! We wandered from the White House over to Chinatown to look around before the Caps/Canadians game started at 7:30. The Verizon Center sits right at the beginning of Chinatown in Washington, so it's kind of neat to see the signs (including the one for the Verizon Center) all in Chinese and English. The gates for the game opened at 6:30, and right away Jill and I noticed something different compared to the last game we were at in DC - PEOPLE! 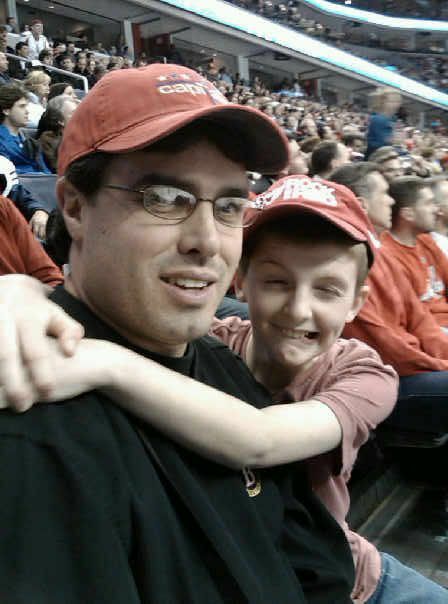 A few years back we went to a Caps game, and when the gates opened we walked unfettered all the way around the concourse. Not on this night though! Washington is obviously a 'fair weather' town, and life is good at this point in the nation's capital for hockey fans. The concourse was packed with people, and it sure did seem like the place was full to the rafters! The difference, besides a winning record, can be described with one name - OVECHKIN! The man is the most incredible player we've ever seen in person, and on this night he scored what was probably one of the greatest goals ever! The game itself was a great one, with the shootout needed to decide a winner. The home team was victorious in the end. After the game, we made our way back over to the ESPN Zone to grab some food (and so Mike could play some games). They were very nice there to Mike, as the manager went and got him a game card for free. Back to the hotel afterwards to grab some sleep!! On Thursday, our intent was to hit as many of the museums on The Mall as we could. We stopped at Cozi for breakfast (and quickly decided we wouldn't do that again! Horrible service!! 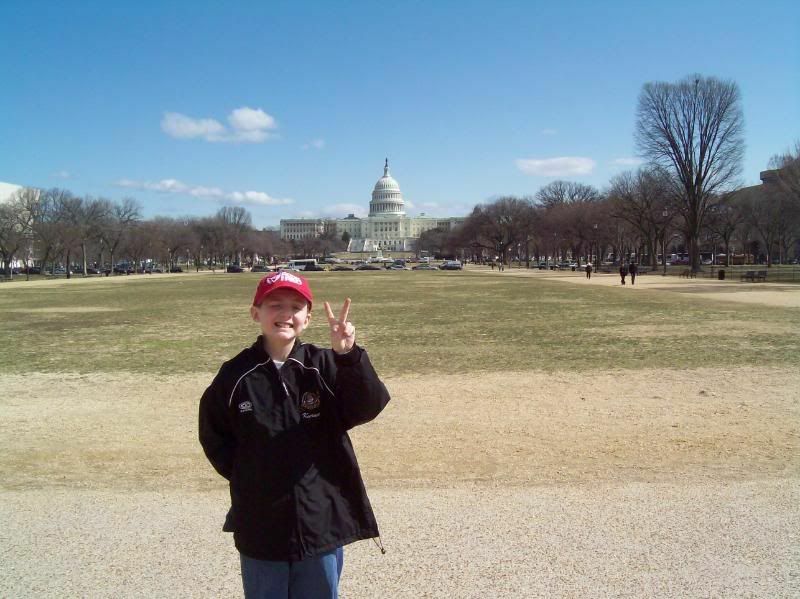 ), and from there went to the White House Visitors Center, located a half block away from the actual White House. There were a few artifacts and other informational areas there, but it wasn't like the real tour (which I took when I was a kid, but isn't offered anymore). From there, we walked down to The National Mall, and made our way to the Air and Space Museum. Now, I'm one for planes and spaceships, but this museum is getting a bit 'dated'. It's probably at least the second or third time I've been there in the last five years, and there really isn't anything new to get me to come back. We spent quite a bit of time (a couple of hours) there, and then made our way over to the Museum of Natural History. The Museum of Natural History was pretty much the same as the previous one we had been to - the same as it's always been, even more dated looking, and incredibly crowded at (with tons of school groups) which made our stay here a lot less just to get away from the noise. We stopped to look at the Hope Diamond, and made our way through the dinosaur area and 'oceans', but then we decided it was time to bug out! The last museum on Mike's list of 'must sees' was the Museum of American History, once another favorite of mine. Strike three on this trip though. The inside of the museum had been redone, and much of the exhibit space had been closed or moved and not replaced. It was very disappointing to see how little was left to see in this museum - Archie Bunkers chair and Mr. Rogers sweater were no where to be found!! At this point, we had had enough of the museums and the people in them, so we headed out in search of lunch. Our walking led us to one of Jill's food finds - Matchbox Vintage Pizza Bistro at 713 H St, NW. We all shared a bistro wedge salad, and then we ordered two small pizza's - a matchbox meat that Mike and I shared, and a Q special which Jill and I shared (kind of worked out well for me!!). For dessert we all shared the special of the house - coffee & doughnuts! Yum! Another great find for food! We walked back to the hotel after lunch, even though it was almost 5:00, so we could rest for a bit before we headed back out. In the evening, Michael and I walked back down to the monuments so he could see them all lit up at night. We walked from the hotel to the World War II monument, then to the Lincoln Memorial, then by the Vietnam Veterans Memorial, before heading back to the hotel - about an hour and a half all told by the time we walked that route! We all crashed out for the night after that walk. On Friday morning, not wanting to repeat the breakfast mistake we made the day before, we hit the Starbuck's on the opposite corner to grab something to eat. After breakfast, Mike had one more museum he really wanted to see - the International Spy Museum. This also gave us the opportunity to ride the Metro, which Mike hadn't done either, because none of us felt like walking the ten blocks to our destination. The Spy Museum was very, very cool, and will probably be a repeat destination for us sometime in the future. Wanting to grab a bite to eat before making the long drive home, we returned once again to the ESPN Zone! Our third time in a week! Once again, the staff there was very friendly, and the manager on duty then gave him a free game card as well. After lunch, we went back to the hotel, grabbed the car, and began the long trek home. We hit quite a bit of traffic from DC to about York, PA, finally arriving home around 7:30 on Friday night. Two Points, None For Style � There�s an old clich� about great teams being able to win when they don�t play their best game, and that one applies to the Capitals in tonight�s 3-2 shootout win over the Canadiens. The Capitals came out strong in the first, and came back to take a 2-1 lead after spotting the Habs an early power play goal. The Caps had several strong early chances to take hold of the game, but some good saves by Montreal goaltender Carey Price and some missed opportunities combined to keep the score close. Washington�s grinders were its best players for the first 40 minutes, and the Caps played poorly as a group in the third. They fell behind midway through the final frame on the Canadiens� third power play goal of the game, but the grinders gained a point for the Caps with a hard-working shift in the game�s 58th minute. David Steckel took an offensive zone draw, and with some heavy lifting from Brooks Laich, the Caps gained possession. Laich pushed the puck back to Tom Poti at the point and Steckel went to the front of the net. Poti floated a wrister netward, and Steckel redirected it past Price to even the count at 3-3. Alex Ovechkin�s highlight reel goal was the one everyone wanted to talk about afterwards, and deservedly so. But it was Steckel�s strike that enabled the Caps to get one point, and then two when Alexander Semin and Nicklas Backstrom both scored in the shootout. It�s another hallmark of great teams to have foot soldiers like Steckel step up and score big goals on nights when the stars are held in check. Another Highlight Reel Tally � Ovechkin added to his league-leading total with his 42nd goal of the season at 10:07 of the first, and the Great Eight also added another clip to his burgeoning highlight reel with his 205th career goal. Ovechkin collected the puck in the neutral zone, then banked an indirect backhand pass off the wall to himself as a means of eluding Canadiens defender Roman Hamrlik. The Caps left wing then gained the attack zone and began to angle toward the middle of the ice, trying to gain position on the backchecking Kyle Chipchura. Ovi then lost his footing but as he did, he brought the puck back and tucked it behind Price, following it to the net as he did. Home Cooking � The Caps opened a five-game homestand and a stretch where they play nine of the next 10 at home with Wednesday�s win. With the win over the Habs, the Caps have pushed their home mark on the season to 23-4-1. The Caps are 30-7-5 vs. Eastern Conference opponents this season, and they are 18-1-1 at home against Eastern foes. Hammering the Habs � The Caps finished the season with a 3-1 record against Montreal. It was the first time since 2000-01 that the Caps managed as many as three wins in a season against Montreal. Washington has now taken the season�s series from Ottawa, New Jersey, the New York Rangers and Montreal. Dealing in Delays � Mike Green�s delay of game minor at 2:28 of the first period was the fifth delay of game minor the Caps have taken in their last six games. Five seconds after Green was seated in the penalty box, Montreal scored to take a 1-0 lead. Leader of the Pack � Ovechkin leads the NHL in goals (42), third period goals (20, seven more than anyone else), shots (369), third period points (35), game-winning goals (five, tied), power play points (30), hat tricks (three), even-strength goals (27) and multiple-goal games (12, no one else has more than eight). Streaking � Ovechkin has recorded at least one point in 10 straight games (11 goals, five assists) tying his longest scoring streak of the season. The streak is the longest active run in the league, and it is three games shy of his career best 13-game streak of last season. Power Surge � The Caps have scored at least one power play goal in eight of their last nine games. Washington is 11-for-31 (35.5%) with the extra man during that span. Power Surge II � Coming into Wednesday night�s game, the Canadiens� power play had notched just three goals in 26 tried (11.5%) over their last seven games. The lethargic Habs didn�t even generate a single power play chance in their last game, a 4-2 loss at Vancouver on Sunday night. Their extra-man fortunes took a turn for the better against Washington. Montreal needed only five seconds of Green�s delay of game minor to open the night�s scoring and the Habs added another power play strike in their next chance courtesy of a Shaone Morrisonn hooking minor in the first period. Montreal took a 3-2 third period lead with their third power play goal of the night at 8:57 of the third, this one from Tomas Plekanec. The Habs needed just nine seconds of power play time to notch that third one. It was the first time the Caps had been victimized for three power play goals in a game since Jan. 20 in a 3-2 loss at Ottawa. For Montreal, it was the first time since Oct. 11 the Habs have had as many as three power play goals in a game. That was the team�s second game of the season, a 6-1 win over Toronto.